This morning marks the start of the public lottery for parents to request their child be placed at a school other than the one they were assigned by DCPS. The period begins today, but doesn’t finish until February 28th at midnight, and DCPS is only accepting applications online. While you do not have a better chance of being chosen through the lottery by applying today, it’s always good to get a head start on application processes. If your child has already “won” an out-of-boundary lottery, you don’t need to reapply to keep them there, they get to remain at that school and follow its feeder path. Good luck, DCPS parents! 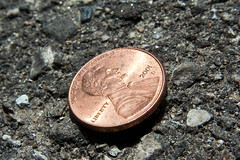 Hope your lucky penny is handy when you hit submit. More questions? DCPS has a handy FAQ for the lottery. For those who don’t have access to the Internet at home, parents can apply at any DCPS school or Library, any DCPS Parent and Family Resource Center, or the DCPS Central Office. The Office of Bilingual Education will also be able to help any parents whose primary language isn’t English. DCPS is also hosting two events for parents with questions: February 10th at Deal Middle and February 15th at Patterson Elementary, both at 6pm.